AAVSO Alert Notice 552 announces an urgent observing campaign to monitor the microlensing event associated with Gaia16aye. Please see the notice for details and observing instructions. 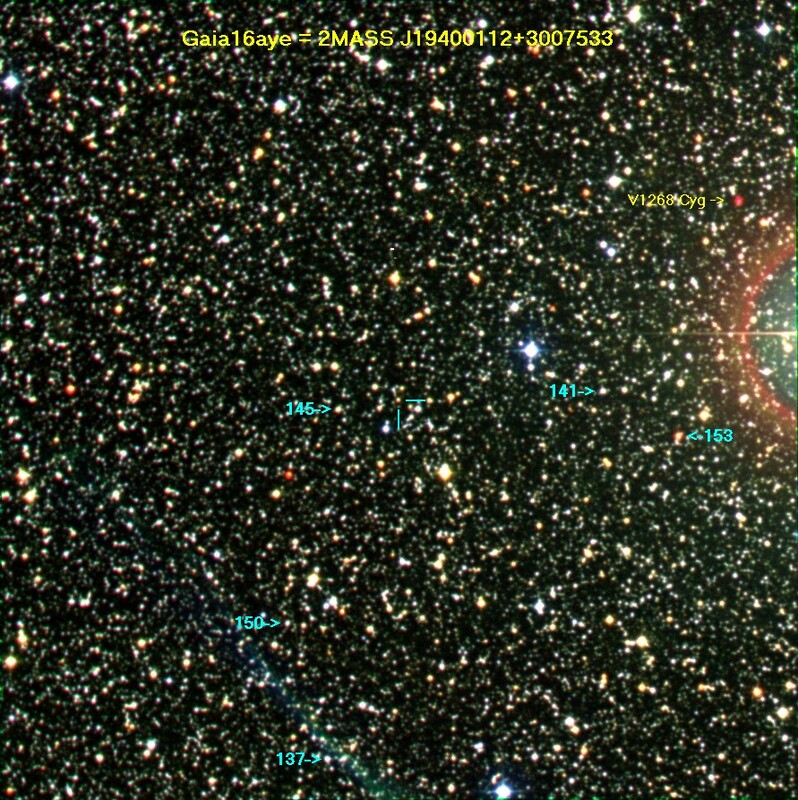 I took a test image last night and its still at the bright state - mag 14.1. Will try a time series in V tonight. The alert notice does not suggest a cadence for the time series. In the lack of guidance, I'd do 5 minutes as a balance between s/n and cadence. Visually it looks like bright, about 14, in my first images. I will do a time series, 10 minutes every 20 minutes. A quick processing shows oscillations between 4.17 and 4.25 (JD 7653.3246 - 7653.3958), to be reviewed tomorrow morning. Getting images now -- almost right on the meridian, and seeing is pretty good. It was stable (14.24 in V) for me last night - 3 hours - did not change more than the SD of the check star (0.015). Data is uploaded (LDJ). Last night I obtained time series of GAIA16aye through Ic band. The star had an average brightness of 12.431 (STDev=0.020). I have used the 145 Comp Star as suggested and used the 153 as a check star. Upon completion of the analysis I noticed that the check star is brighter than the AAVSO sequence suggests. Sequence states that 000-BLZ-862 (153) in Ic should be as bright as 14.688 while the 145 Comp star (000-BLZ-858) should be 13.393 hence the latter should be brighter and not the opposite. The SNR on the VPHOT Summary window suggests that that COMP 153 (check star) remained stable troughout the session (which makes observations conducted for GAIA16aye valid?). Below please find a link to screenshots of VPHOT. I suppose that long term variability is possile for 153. The star Stephen is using as 153 Check star is very red, actually waaay too red even for K8/M2 variable star. Also, AAVSO sequence X16608AQ lists 153 coordinates as 19:39:37.03 30:07:15.8 with B-V=0.500. However the light in the Infrared goes from 2MASS J19393679+3007150 (19:39:36.80 30:07:15.0) with J-K=1.3 (J=9.715 K=8.415)! Definitely not worth using it as comparison star. Another issue is that AAVSO sequence doesn't list Rc and Ic magnitudes of comparison stars for X16608AQ which is a real pity in this case. When you create a chart using VSP, at the bottom of the form is a set of tick boxes for the different filters. Click on the ones you want to be included, and the photometry table created will include those mags if they are available. For Gaia16aye, there are Rc and Ic values for all but one comp star. Thank you Elizabeth! I have clicked on "default" sequence from VSX entry, and it looks like only V mag and (B-V) values are given by default. While using VSP with BVRcIc magnitudes checked, I have obtained the following for 153 comparison star: B=15.802 V=15.302 Rc=14.986 Ic=14.688. Meanwhile USNO-B values for USNO-B1.0 1201-0386930 star are: B1=17.65 R1=15.26 B2=17.43 R2=14.80 I=14.38. Those blue magnitudes look more reasonable for the red star with J-K=1.3 in 2MASS (J=9.7 K=8.4). Maybe it is variable itself, as Stephen suggested. Many thanks for the explanation Denis. I will submit my observations through the use of another check star. Here is the color-combined (from the POSS-II Blue, Red and Infrared plates) finder chart centered at Gaia16aye. You can see how difficult is to select good comparison stars in such a crowded field! I have also marked the known Mira variable V1268 Cygni 7.4' from the microlensed star. Best Comp(s) and Check Stars to Use? Thank you for the information and the image, Denis. Given these factors, and the very crowded field, what comp/check stars would you recommend? We think this is a binary microlensing event, which undergoes double caustic crossing - this means we still expect another brightenning episode to occurr sometime in next days or weeks. A typical caustic crossing has a sharp rise, then a U-shaped plateau and the caustic exit is reversed - slow rise and rapid decline. In order to understand this event we need to cover the last caustic exit very densely. It will probably last for one day and should reach 12 mag in I-band and 13 in V.
Currently the brighness declines smoothly, but do let us know if you spot it going up again. I suggest the cadence does not need to be denser than 30mins now. Only at the actually caustic crossing we would need such high cadence. from Warsaw University Astronomical Observatory, Poland. Continued interest in this target? We are getting nigh on to the end of October. Is there any continued interst in nightly BVRI data for this target? Gaia16aye will soon get brighter again! But the exact timing of the final peak is not well known, so we have to rely on your observations to detect it. Re: Gaia16aye will soon get brighter again! I noticed you have raised the forecast of 4th peak's brightness by almost the whole magnitude, from initial 12.6m to 11.8m. Are you seing the orbital motion of the binary lens? The models are assuming the fixed positions of two stars by default, but the stars are obviously orbiting around each other, changing the caustics geometry in the sky plane. From the mass ratio q=0.17391 we can exclude the star+planet lens composition mentioned in ESA news as one of possible scenarios. From the statistical considerations, this is most likely a WD+RD pair (detached, not interacting). The orbit size should be about 1 AU (assuming the lens velocity relative to the target star about 30 km/s), and since the August the binary star should have rotated by 1/3-1/4 revolution. Too pity the magnified star is a giant. If it has M=0, the white dwarf in the lens should be fainter by 10 magnitudes before lensing (assuming M=11.5 and position exactly halfway). And even more during the lensing. Seems to be impossible to detect any traces of lensing object in the combined spectrum. It looks like I've been the only AAVSO observer in the past few nights (reporting anyway). I got it last night from my two robotic telescopes (25km from each other and about two hours apart in time) and there is a slight increase in brightness of 0.04. It may be just instrumental, but I thought I'd mention it in case its real. It will be cloudy here in Nova Scotia tonight - decent forcast after that however. I made observations with T24 (itelescope/Sierra Nevada) and they seem to confirm your observations (9, 10 and 11 nov.). Yesterday evening, between 18:30 UT and 20:00 UT, I could do three observations with T18 (Spain). The measured magnitude decreased from about 14.6 to 15.0. Is this the rapid faiding of Gaia?? I'm not sure; the moon is quite bright and the SNR of the images is rather low. So it would be good if someone could confirm this trend. I added my observations. Unfortunately, my sheduled observation at T24 (Sierra Nevada) failed due to bad weather. Somehow it cleared for long enough for one of my scopes to open up last night and it grabbed a few observations. It shows no change (a bit less scatter than yours). Gaia16aye will get brighter again not so soon! Please note that Warsaw University team has once again updated the forecast of the caustic crossing time and the brightness of the 4th peak! The caustic exit is now expected to occur on November 17.5 UT (not on Nov. 16.0 as posted on their website a day ago), and the peak magnitude should be 11.1m instead of 11.8m. Looks like we do see the lens in motion as the event progresses! Indeed, our new predictions of the final caustic crossing have again been shifted, given all the observations so far. It will probably occur even later, around 20th. So, please keep observing. However, the very slow rise is now apparent. The question of the orbital motion is a very valid one, Dennis. We tried to include it in our model, however, the data so far does not yield any yet. We just need to observe the moment of the 4th caustic crossing to find the right solution, with or without the orbital motion. Clear skies, and please do carry on observing this exciting object! according to the updated model prediction by Przemek Mroz http://www.astrouw.edu.pl/~pmroz/Gaia16aye.html the caustic crossing event for Gaia16aye should happen tonight (November 20 to 21st). Please try to observe this object recording a long time series, if possible. The object's brightness should evolve rapidly in the next hours. It is OK to use any one of the standard filters, or observe without a filer if none are available. Early last evening (Nova Scotia, Canada time), measurements that I made show it past the peak at about mag 15.9 (mean of 30 minutes of 8-minute images). Thank goodness for automation as it was supposed to be cloudy all night, but it cleared for a while, woke up and did its work!